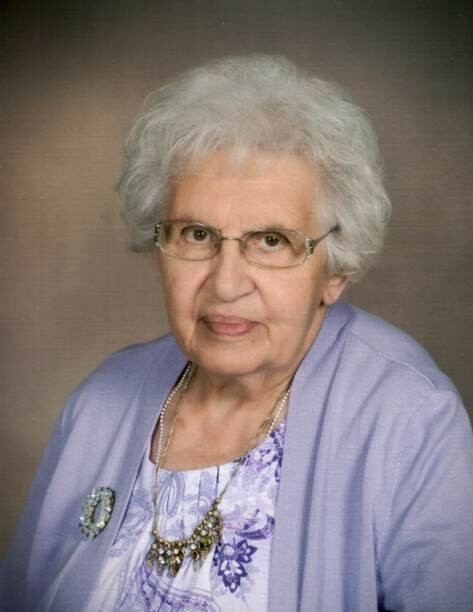 Magdaline Schafer, 94, of Mandan, passed away January 14, 2019 surrounded by her loving family at Miller Pointe, Mandan. Mass of Christian Burial will be held at 10:30 AM on Friday, January 18, 2019 at St. Joseph Catholic Church, Mandan, ND with Rev. Josh Waltz as celebrant. Burial will follow at the North Dakota Veterans Cemetery. Visitation will be held Thursday, January 17, 2019 from 5:00-8:00 PM at Weigel Funeral Home, with a CDA Rosary/Parish Vigil at 7:00 PM. Visitation will continue one hour prior to the service on Friday. Maggie was born on May 25, 1924 to Christ and Clementine (Barnhardt) Geiger in Crown Butte, ND. Maggie was raised on her family farm in Oliver County. Growing up as a farm girl instilled a work ethic in Maggie that was to be admired. She was educated in a little country school near Crown Butte, ND. She met John H. Schafer, the love of her life, after moving to Mandan as a young woman, they were married November 11, 1946. Maggie worked at Cloverdale Foods on Main Street in Mandan and then at Bills Super Valu in the meat department until her retirement. She enjoyed being around family and friends, especially entertaining and preparing food for family events. Her German potato salad and prized meatballs were recipes most asked for as well as her knoephla soup! She will be remembered by many as they dry dishes with the dish towels she so lovingly embroidered and gave as gifts. Gardening, crocheting, and crafting of many kinds kept her busy; and a good game of pinochle or Gin Rummy with her sisters and brothers was played weekly. Maggie was a lifetime member of the Catholic Daughters and St. Joseph Catholic Church. She had a deep faith and we rejoice with her as she enters the gates of Heaven. She will be deeply missed by all, especially her by her children, grandchildren, and great-grandchildren. Maggie is survived by two sons, Larry (Connie) Schafer and Dennis (Jolene) Schafer; one daughter, Karen (Don) Nuss, all of Mandan; 10 grandchildren, Brian (Pam) Schafer, Brad (Sharyl) Schafer, Brent Schafer, Brandon Schafer, Jason (Tammy) Schafer, Shanon (Steve) Gerding, Theresa (Casey) Meidinger, Kristin Nuss, Heather (Jerry) Lindsley, and Christopher (Sarah) Nuss; 20 great grandchildren; one brother, John (Fran) Geiger; sister, Justine Fleck of Tacoma, WA; sisters-in-law, Cecilia Geiger and Ellen Schafer; brother-in-law, Clem (Betty) Schafer; and many nieces and nephews. She is preceded in death by her husband, John; her parents; 3 brothers, Frank, Matt, and Jerome; 3 sisters, Beada, Rose, and Ann. Go to www.weigelfuneral.com to sign the online guestbook and share memories with Maggie’s family.